Bath bomb/ bath fizzy / bath seltzer is used to enhance your bath time experience! They are filled with moisturizing and skin-nourishing oils and butters. 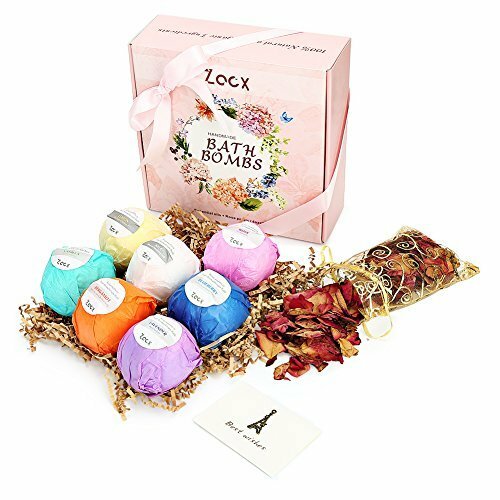 Fill your bath tub with warm water, throw in a Zacx Bath Bomb and sprinkle some dried rose petals.Enjoy your aromatherapy bath. Do not use if pregnant or if allergic to any of the above ingredients.If irritation occurs, discontinue use.Keep out of reach of children except under adult supervision.Oils may make surfaces slippery.For external use only. Exquisite Gift Set: The ideal beauty box with a delicate ribbon bow, for Christmas, Thanksgiving Day, Birthday, Valentine's Day, Mother's Day, Memorial Day and Other Occasion.A card is given in the box, you just need to fill in the greeting. 7 X 4oz Bath Bombs + 1 Bag Of Dried Rose Petals: The same price, get bigger size items which contains more essential oils. We picked up roses with larger petals, no longer let the dregs from the petals embedded in the bath bombs dirty your bathtub, you can choose whether to scatter flowers. 7 Different Natural Essential Oils For Your Choice: Milk, Lemon, Bergamot, Blueberry, Rose, Lavender, Vanilla.Different taste, different moods. Moisturizing skin care: Our handmade bath bombs rich in Essential Oils, Shea Butter and Cocoa Seed Butter, moisturize your skin and delay the aging of it. FIZZING & COLORFUL：Completely dissolve in 3 minutes, enjoy a relaxing, colorful and moisturizing Spa treatment at home. If you have any questions about this product by Zacx, contact us by completing and submitting the form below. If you are looking for a specif part number, please include it with your message.